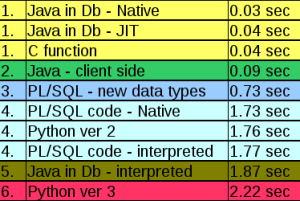 Main goal of this article is to show performance comparison mainly between PL/SQL and Java (running inside and outside of the Oracle Db), with included C and Python code just to be able to compare results. This may hopefully help you to decide where you are going to put Java CPU intensive code when you’ll have such case. The following text is just extract from my presentation held last year on regional OUG. There are many methods to load Java code into the Db. If I’m using native compile (ahead of time compilation), the result are same as with JIT with one important difference: by using native compilation, I’m able to control which methods I want to have in compiled state, which means I don’t have to rely on JIT. For testing purpose I’ve created the same method in C.
As you can see, Java in native compiled state (or after the JIT) is running at the same speed as C code. Next step is to see how PL/SQL store procedure will execute the same code. As you can see, the results are disappointing. Although we’ve used native compilation, we expected to see much better results, as this is pure CPU intensive code. For interpreted version of PL/SQL code, results are within my expectation. The same results I’ve got with native compilation. Results are better then PL/SQL optimized code, but not as fast as Java in Db or C code. In first case I’m using Python 2x, and Python 3x in second case. 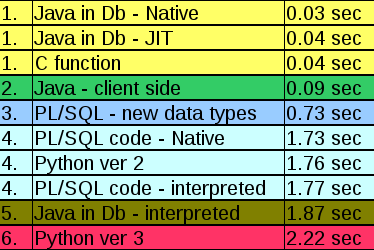 As expected, Python was the slowest of all combination, although version 2 is faster then version 3. Let’s build table that will consist of all tested combination. There are different kind of performance tests that can be performed, but I concentrate on most simplistic case: just an ordinary loop statement. This tests cover only CPU intensive tasks. Results for data intensive tests will be covered in other blog. For now, I can only tell that results will be very different from CPU intensive tasks. In case of Python, we can speed it up by using Python numerical libraries, but that is not a goal of this tests. I rank the test values by joining test values into the same group where results difference are below 0.1 sec (for example, the first four places are within the same group, as well as group with rank 4). a) Create Java Stored Procedure that will run inside Oracle Db (in the same namespace). In cases where the method that is working on CPU intensive task will be called many times, you can rely on JIT. In all other cases it is much better to use Java Stored Procedure in native compiled state. b) Process CPU intensive tasks on Middle Tier by using Application Server, or on the client machine. c) Create external C procedure callable from Oracle Db. As the last option c) is hard to configure and debug, there are only two options left. As Db resources (CPU and memory) are often well used (nobody wants to spend extra money for Oracle Db licenses that are not going to be used), the most common scenario is to do all calculations on Application server (or grid of apps servers) or on the client machine.